Lincoln Park is one of the city’s most affluent neighborhoods and is home to some of its most significant tourist attractions. It’s home to DePaul University and Chicago hot-spots like the Lincoln Park Zoo, Sweet Mandy B’s and Second City Improv. But not far from many of those attractions, other businesses are failing. Between Clark Street and Sheridan Road on Diversey Parkway, there have been a cluster of businesses that have either turned over or closed down within the span of about a year. These business are spread between the Lincoln Park and Lakeview East neighborhoods. Many businesses have closed, including Pizza Persona and Langford Market, while new businesses have popped up, including Yolk. and mfk. These business failures could be blamed on poor business sales, but the success or failure of a business rides on much more than one factor alone. “There are a million ways to go out of business; I think rent prices increasing push people out more than anything,” said Scott Worsham, 51, owner of recently opened restaurant mfk. A recent study by Small Business Trends showed that 50 percent of new businesses fail within the first year, while 95 percent fail within the first five years. The most high-risk businesses include independent restaurants and retail stores – the same types of businesses that have been closing in Lincoln Park and Lakeview East. Another study published by The Washington Post showed that new businesses have a 39.8 percent chance of surviving the first six years. When looking at the demographics of the Lincoln Park and Lakeview East areas, it is surprising that business is so bad in these neighborhoods. The average income in Lincoln Park is $115,774; in Lakeview East, 56 percent of residents earn $50,000 or higher. Patrick J. Murphy, a business management professor at DePaul University, explained that in the case of these Near North neighborhoods, business are failing because the areas are already well-off, therefore there’s no place for them. 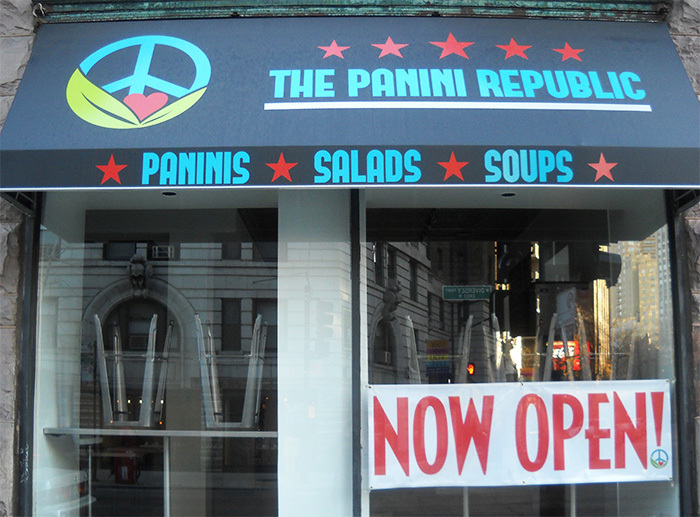 Despite Murphy’s hypothesis, Yoav Saada, 28, owner of The Panini Republic, says he has the recipe for success in Lakeview East, wrapped in his fresh paninis. The restaurant has only been open since late September, but Saada felt that with DePaul and a handful of hospitals nearby, the location of his restaurant has potential. He also said that with his fresh meat and veggies prepared in-store daily, there is no competition to his menu. “There are a few paninis at Panera, but they don’t come close to my quality,” Saada said. According to Murphy, the number one reason for business failure was dysfunction within the team of the business. Often times the dysfunction begins with bad employees hired by the owner or manager. An incompetent employee leaving a company costs the owner money, and a good employee leaving costs them even more. This is why it’s important for business owners to hire good employees and be able to keep them. But another reason Murphy cited is a problem with the plan of action for the business before it even gets on its feet. “The founder, or whoever comes up with the original plan […] doesn’t effectively distinguish between his or her idea and the opportunity that they’re going after,” he said. Murphy explained that the idea for a business, or the type of establishment an entrepreneur or owner is looking to open, must complement the opportunity for that idea. For example, if a neighborhood is missing an ice cream shop, there is opportunity for an entrepreneur to open one in that neighborhood. Having an idea without an opportunity or vice versa spells trouble for a business, he said. Yolk., the Chicago breakfast and brunch giant, opened a new location on Diversey Parkway in March of 2014. While Liagridonis thinks Yolk. will find success on Diversey, other well-known chains nearby like Nine West Outlet and Jamba Juice have failed to keep their doors open. Murphy attributes that to the fact that these chains have corporate offices that they report to. If a certain store location isn’t performing at the level of others, the corporation may force that location to close. When a business fails, the owner then must go through the process of closing his or herbusiness down: filing tax returns, reporting capital gains and losses, all of the tedious, robotic steps necessary for a mess-free shutdown. But Murphy said that the most difficult part of closing down a business is not the process itself, but the psychological toll on the entrepreneur. Worsham admitted that failure is an intimidating thought. “Spending a lot of money to open the doors and having some great people, then failing them all — that’s the biggest [fear],” Worsham said. With all the new businesses opening in the area between Clark Street and Sheridan Road on Diversey Parkway, there’s no telling which of them, if any at all, will find their niche market in Lincoln Park. However, if these entrepreneurs want success, they have to make sure all of the elements of their plans come together to create good business. “Let’s say the right talent or knowledge, in the right place, at the right time, combined with the right goals – and then a little bit of luck,” Murphy said.